Press & Media Page of Together We Pass - Find out more! Press & Media Page of Together We Pass - Find out more! On Thursday, 11th of April, 2013, our free ebook “…Now What? 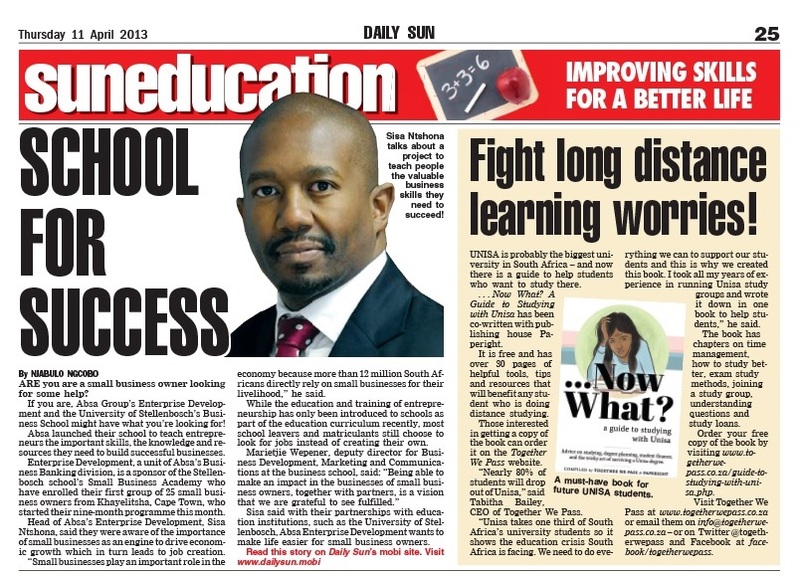 A Guide to Studying with Unisa” was featured in the Daily Sun. Fight long distance learning worries! UNISA is probably the biggest university in South Africa – and now there is a guide to help students who want to study here. …Now What? A Guide to Studying with Unisa has been co-written with publishing house Paperight. It is free and has over 30 pages of helpful tools, tips and resources that will benefit any student who is doing distance studying. Those interested in getting a copy of the book can order it on the Together We Pass webiste. 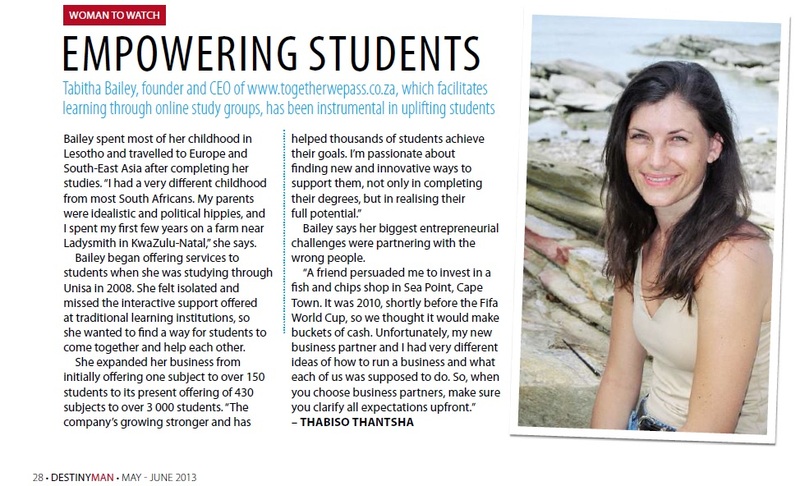 “Nearly 80% of students will drop out of Unisa.” said Tabitha Bailey, CEO of Together We Pass. “Unisa takes one third of South Africa’s university students so it shows the education crisis South Africa is facing. We need to do everything we can to support our students and this is why we created this book. I took all my years of experience in running Unisa study groups and wrote it down in the book to help students.” she said. The book has chapters on time management, how to study better, exam study methods, joining a study group, understanding questions and study loans. Order your free copy of the book by visiting http://www.togetherwepass.co.za/download-your-free-copy-of-now-what-a-guide-to-studying-with-unisa/. Visit Together We Pass at www.togetherwepass.co.za or email them on info@togetherwepass.co.za – or on Twitter @togetherwepass and Facebook at facebook.com/togetherwepass. Bailey spent most of her childhood in Lesotho and travelled to Europe and South-East Asia after completing her studies. “I had a very different childhood from most south africans. My parents were idealistic and political hippies, and I spent my first few years on a farm near Ladysmith in KwaZulu-natal,” she says.